RUINBROS doesn't have any sort of a framing narrative and it's not inclined to provide anything to be discerned from its environmental design. Its novelty rests entirely on the aesthetic of the setting which as mentioned exploits a classical look, heavily informed by the Aztecs as well as details cherry-picked from other, similar cultures that I wouldn't recognize because I'm not a scholar of Mesoamerican antiquities. Aro's microcosms consist of outdoor areas composed of exposed rock, courtyards to give the overgrown step pyramids and temples a more relatable feeling, and the interiors of these places. The indoor sections are not inherently interesting on their own. They succeed in part because Aro has included a number of elements that work together to element their boxy, utilitarian chambers. One of the biggest is the inclusion of world-building windows; they serve as peepholes into surrounding environments, existing only to be glimpsed. 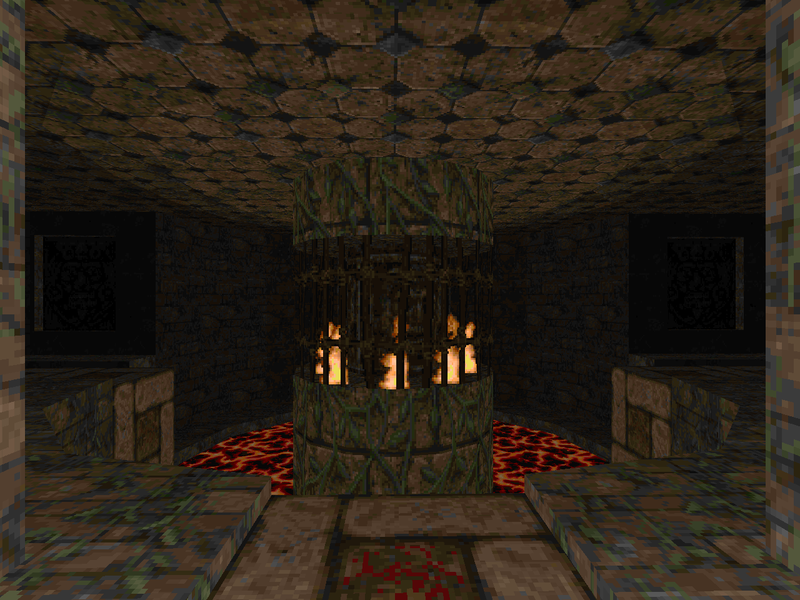 These portals are also used to add a sense of connectivity, whether to other chambers or the landscapes from which you just entered. I also like the author's attempt at lightcasting. It enhance the claustrophobic, moody feel and complements running into monster closets every few meters. Congestion and paranoia dominate in the Brotherhood's inner sanctums. They're rarely so overrun that I felt like I was completely at the author's mercy but there are a few fights - particularly one near the very end - where I felt overwhelmed. At the end of your adventure you will have a sixth sense for when an ambush is likely to occur and where it is bound to come from. The frequency and immediacy of these traps may be the primary stumbling block for potential players. Their predilections may have them quitting in rage or resigning out of bemusement at the sheer predictability. Will the novelty of Aro's Aztec trappings be enough? From what I can see, the average user is not put off at all. The constant explosions of combat combine with the claustrophobic confines and painstaking lightcasting to create a cocktail that is capable of carrying the set purely by the merits of its atmosphere. The journey being limited to a total of seven levels certainly helps. Standout encounters are few and far between when your maneuverability is limited to narrow corridors and small square chambers; the adventure as a whole tends to blends together. I have a better memory of the outdoor yards that serve as the connective tissue. The naturalistic landscapes and temple lawns complete with building facades serve as much stronger set pieces. The sheer size of the available playing area offers the potential for more dynamic encounters. Sometimes it's a result of having to dodge attacks from multiple angles as enemies peer over ledges on the periphery but more space benefits monsters in the field as well. One of my favorite fights involved turning the low ground into a demon mosh pit while cacodemons started filtering above your upper tier. You're still technically highly mobile but a lack of situational awareness could drop you into a brook which isn't inherently hazardous but might expose you just enough for your foes to get a few cheap shots in. The environmental pacing of Brotherhood involves the interpolation of these two elements, helping to distract from whatever shortfalls may exist with the combat within and the lack of atmosphere without. Mood lighting is virtually nonexistent in the outdoor spaces and while you'll see occasional tricks like wooden awnings and monumental structures their realistically rectilinear nature robs them of the sort of awe that you experience when seeing some of the wall carvings and floor reliefs. There are still cool things, to be sure, but RUINBROS succeeds because Aro directs you through the layouts in such a way that you never spend too much time at either extreme. The set is technically pistol start friendly but I would definitely treat it as a challenge mode to be tackled after a normal run. You'll absolutely want to know where the secrets are because they contain essential weapons. 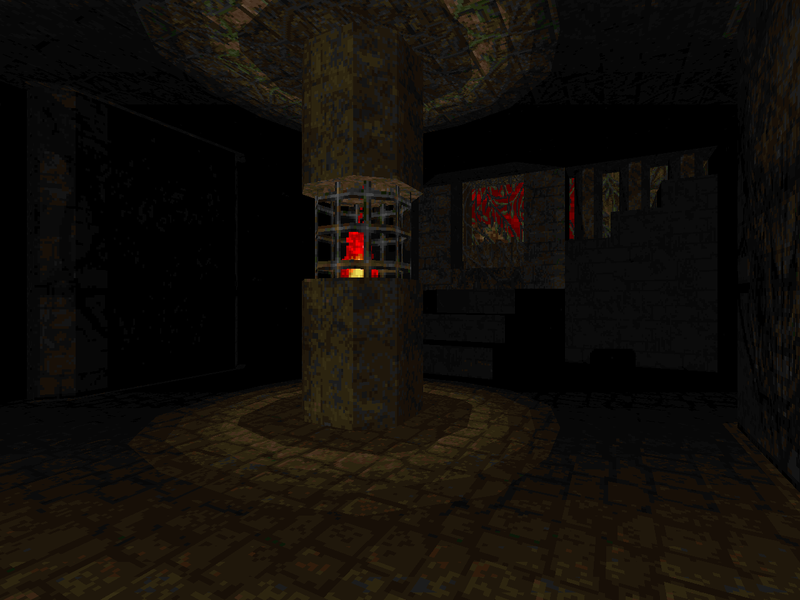 For instance, MAP04 is just about impossible without grabbing the rocket launcher from a concealed closet in the opening room. Other signs include situations like MAP03, which has a lot of cell ammo but the plasma gun itself is only found near the end. Continuous players can carry over a hidden energy weapon in the previous map and have a considerably easier time. Ammo for me was so tight that I had to resort to survival-style gambits like punching stuff to death, manipulating monsters into infighting, and just plain leaving inessential foes behind. I can't promise that a continuous run will eliminate the scarcity situation but you'll be far better off than had you try each one from scratch. 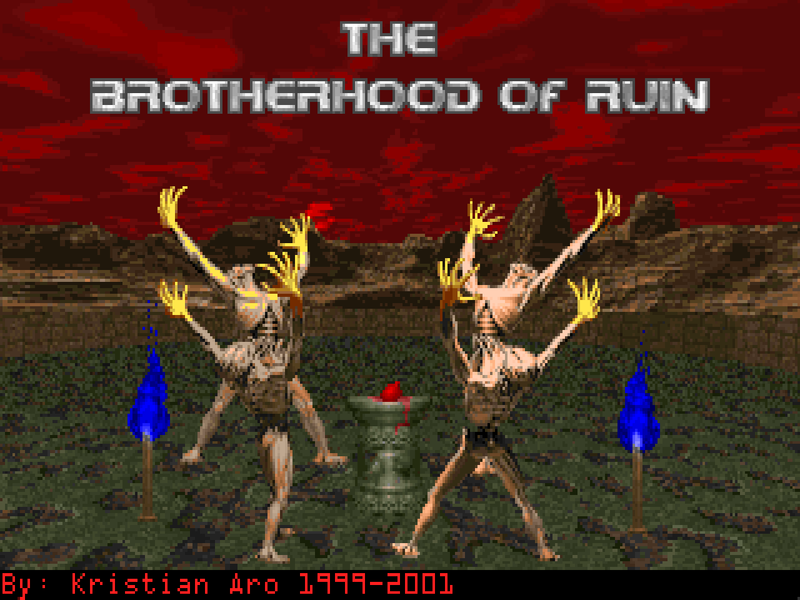 Brotherhood hasn't left the largest legacy but its influences can be plainly felt in Alando's Temple of the Lizard Men series, particularly those moments where I had to activate two parallel switches in a room in order to open up a gate. Sometimes there was enough linearity and repetition at these points that I felt less like I was running a gauntlet of nested monsters and more a switch marathon. You're equally likely to find yourself backtracking through yards and between structures in an effort to reach the final gate. You might even get lost! Most of the time, though, you'll be drawn through the Aztec-like ruins by the atmosphere and aggressive drip feed of action. Aro has a handpicked selection of tunes. Roughly half of them are courtesy of Paul Corfiatis and I assume originals. There's an air of suspense about them and the first time I heard the thunder in MAP01 I thought that it was some kind of ambient noise. 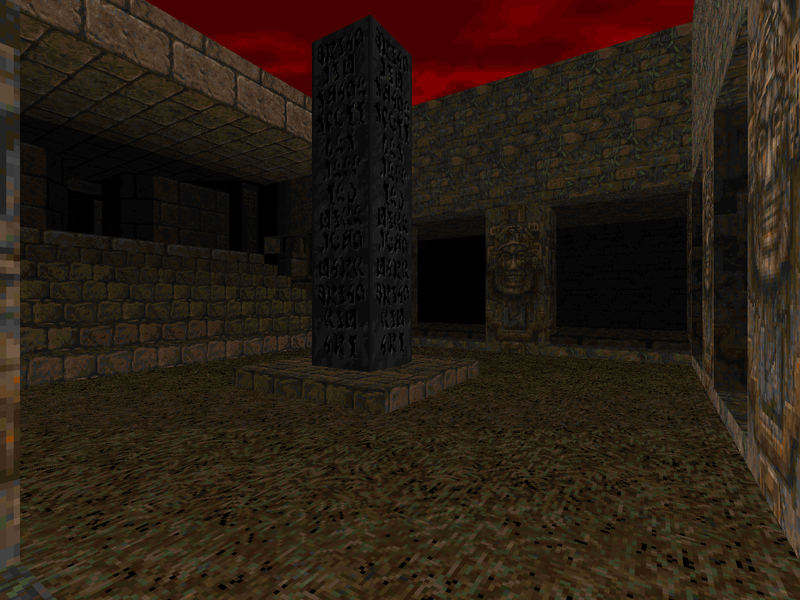 Of the rest, three were composed by Raven Software strongman Kevin Schilder, though the one track from Hexen II actually belongs to the Greco-Roman themed hub. 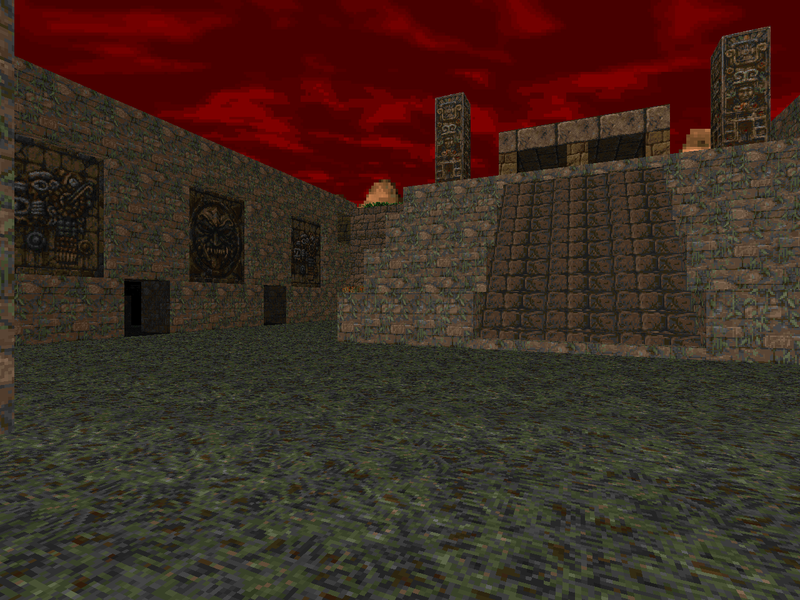 Classic Doom trivia buffs may note that one of Peter Thomaselli aka Kniggit's public domain tunes appears here. Gaston Lahaut apparently found it unfit for his Mordeth project but it slotted right in The Brotherhood of Ruin! RUINBROS is a really cool mapset and has a theme that's rarely seen outside of stuff featuring reptilian people straight out of Hyperborea. And maybe a Mayan Mishap or two. Gameplay snobs will likely take issue with its stop-start pacing but you won't find a more substantial work leveraging Mesoamerican iconography. At least, not without mixing in Egyptian stuff too. I'm looking forward to see what Kristian did some twelve years later with Lost Temple. Nails the atmosphere. You immediately see where the author's main focuses are. First comes showing off the Mesocamerican texture set in the simple, indoor areas and the second the lengths at which he goes to create appealing, naturalistic settings. The latter's best example is the molten canyon to the northeast but the western depression and indeed all of the outdoors are great. The author isn't big on pressure this early on but there's still an edge to moments like the revenant in the colonnade room. 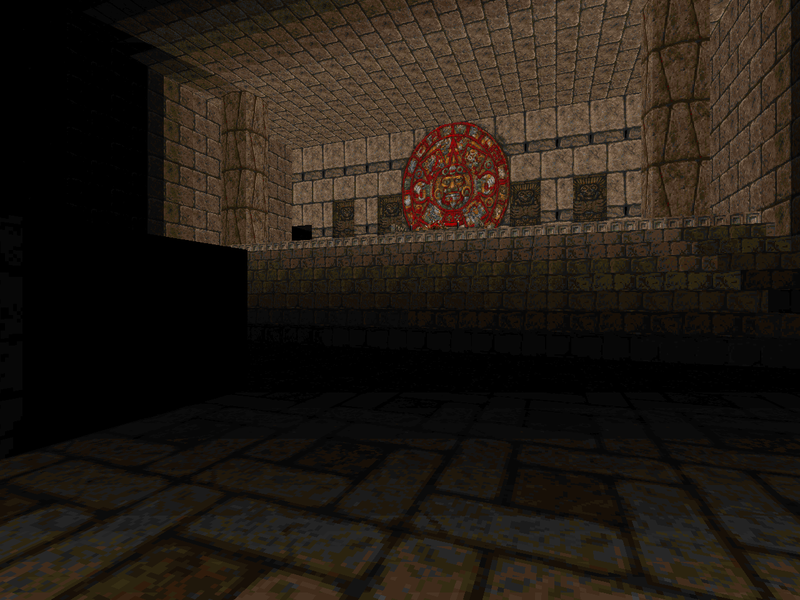 I enjoyed the player exposure in the chasm leading up to the exit. The cacodemon / pinkie ambush has a neat dynamic where the beasts on the ground occupy the space you would want to dive into to escape the gasbags. This eschews the outdoor areas that made the opener so vibrant and instead focuses on rectilinear ruins. The end result in retrospect is rather stringy. It still looks really cool since it better evidences Aro's theme of choice through interior details like columns and reliefs on the walls and floors. 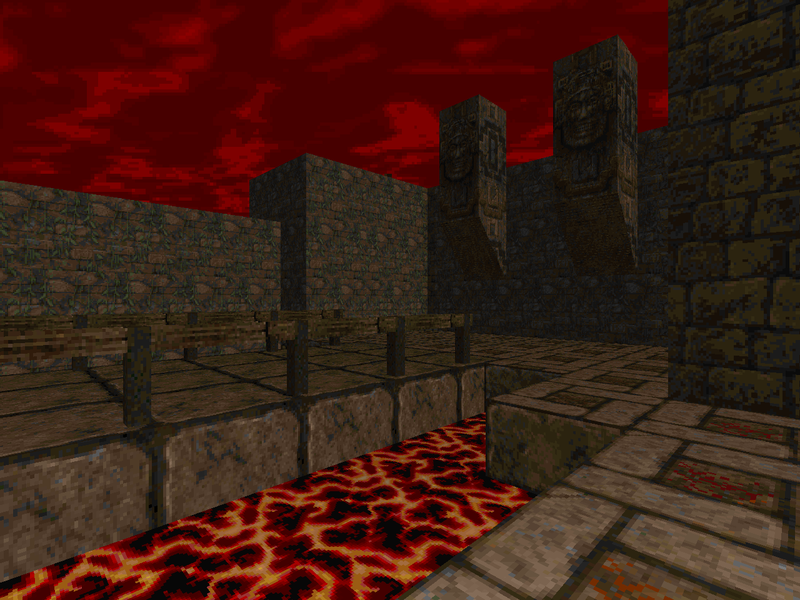 The step pyramids are cool but my favorite segment is the windowed walkway running toward the south, overlooking the eerily lit altar chamber, and outside to a descending staircase in one of the few exterior locations. The combat leverages beefy monsters and claustrophobic confines, throttling the speed of action to something of a dungeon crawl. It also has traps to match. One of the tougher ones puts you on the other side of a bridge opposite chaingunners and revenants. Interestingly, there are three trios of Barons to be encountered on UV. Aro better fulfills the promise of the quasi-Mesoamerican setting. 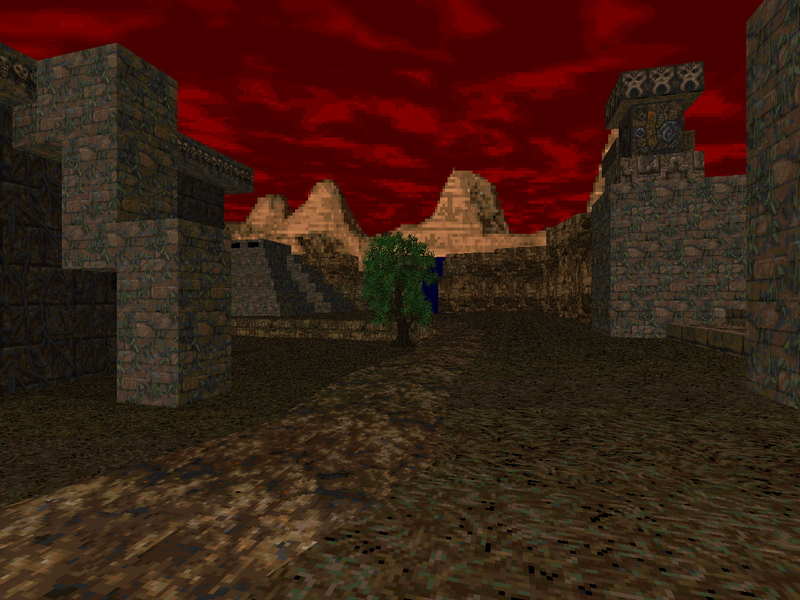 The layout is dominated by a large, outer yard that has several step pyramids. The hot start gets you engaged because you have to figure out where the initial threats are and the colonnade spanning the southern edge makes for a great baffle for when you release the enormous demon ambush. 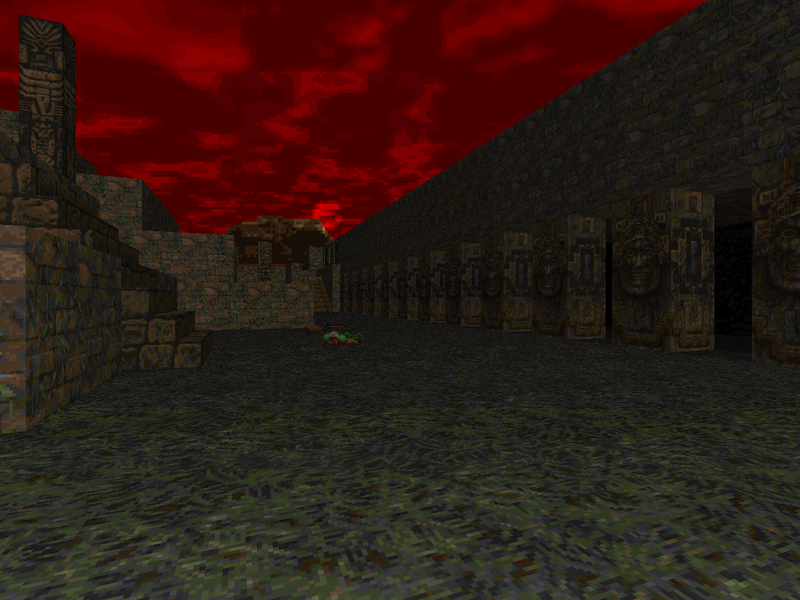 I had a tough time with ammo but that's partly because one of the "secrets" ushers in a cloud of cacodemons. Continuous players are likely much better off as there's a drip feed of cell ammo that scratchers will find useless up until the very end where you can acquire a secret plasma gun. Otherwise it's survival style to the point of having to lure a crowd of mancubuses out so that you can run around them and fetch supplies from an ammo cache behind them. The trap following the megasphere grab is interestingly disorienting. A thorny level. Its opening few rooms challenge any notion of gliding by on pistol start; you'll absolutely need the secret rocket launcher to chew through an early arch-vile and soften up numerous other threats. Like the previous level, it's got a big outdoor area to the south with a handful of small annexes coming off of it to explore. In sequence, of course. I like the bits of interconnectivity in the windows and most memorably the caged exit corridor glimpsed from the interior of the northeastern building. There's also a secret BFG which should allow you to cheese many of the more awkward fights as well as the first Cyberdemon. Some cool architecture and bits of world-building. Having to ford the lava between the Hell knight towers is a little counter-intuitive given the previous run-ins with molten rock, but it was still a fun moment. Aro delivers on the promise of naturalistic landscapes as glimpsed in the opener. They aren't as complex as the lava canyon, of course, but they're a breath of fresh air in the oft orthogonal ruins. The largest of the excursions is a canyon crawl to the north, which suggests a tactical combat approach. The author tilts the scale even harder toward survival-style play. The breaking point will be your return through the crevice, where you'll be confronted by an arch-vile who's probably resurrected his own personal army to block you at the door. Players carrying resources over will have a MUCH easier time. If you skip the least threatening stuff and manipulate infighting, you'll probably build up enough scratch to be able to punch through and then come back to clear the leftovers. If that's important to you, of course. 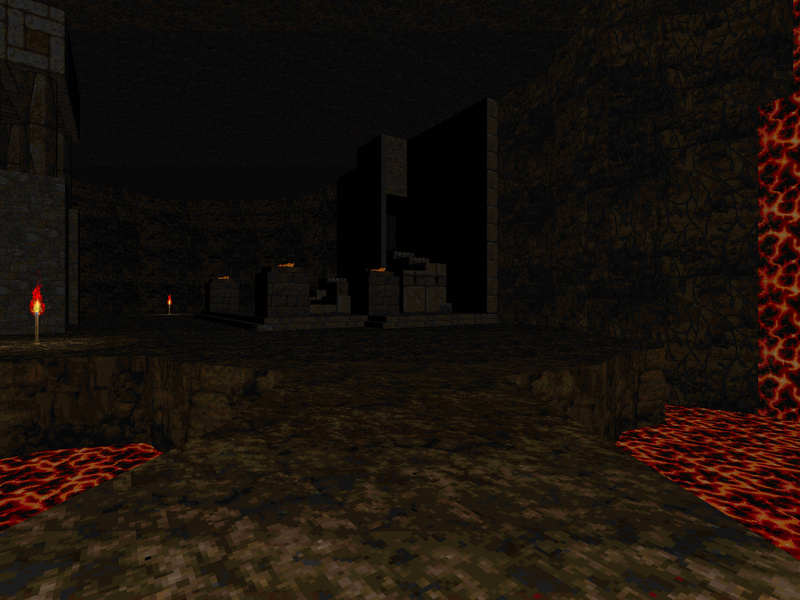 The little "U"-shaped annex accessed via teleporter and which returns you to the starting area is aggressively trappy. Skip it if you don't have to kill it and if you can punch it to death, well, you'll be better off! 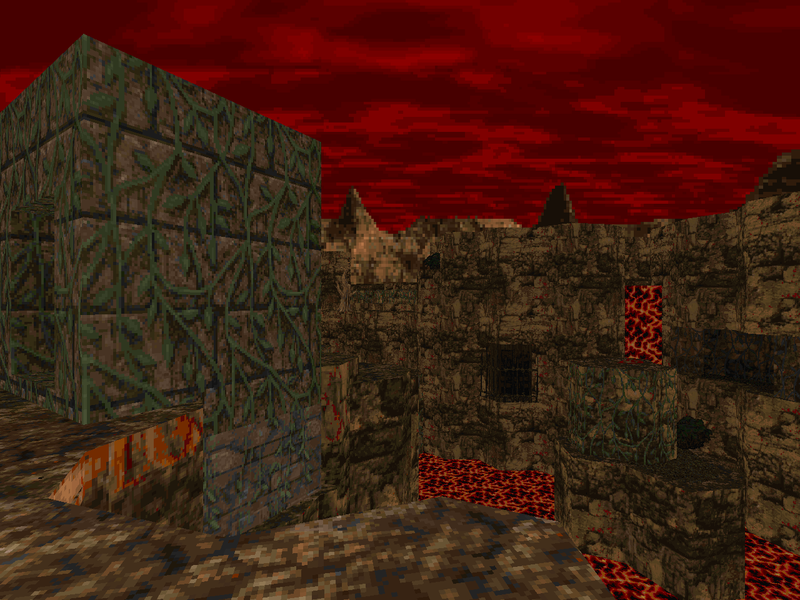 This is a long level and much of it is dominated by cavernous landscapes rather than only appearing as highlights as in the previous level. Traps are as deadly as ever and player exposure is very real in those wide, open spaces. Aro gets away with one of the most nonchalant Cyberdemons I've seen in a long time; it was a pleasant surprise. This has some of the coolest interior architecture I've seen of the set so far. 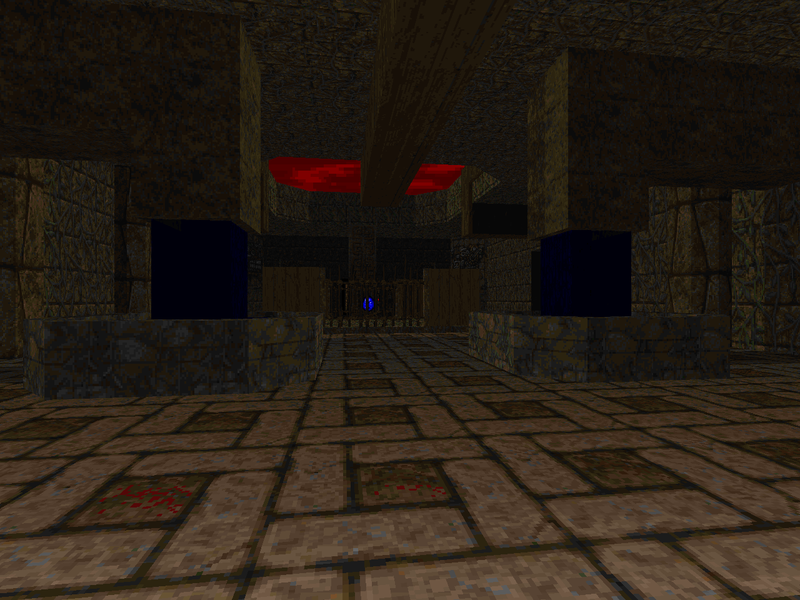 I particularly like the great hall that runs from north to south in the center of the level, especially the part past the :LAFFO: crusher hallways. 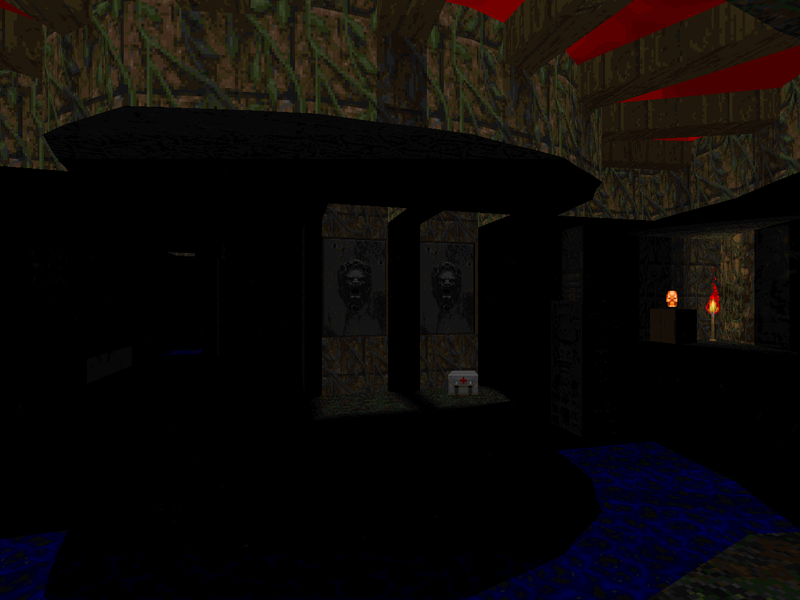 No real standout fights apart from the Cyberdemon; just oppressive monster placement all around. It isn't anything that you haven't already seen as far as general scenery and gameplay goes but there are some really cool visual setpieces. I'm mainly thinking of the circular chamber connecting the four wings of the central temple together. There are other such vistas, though, including a quadruplet of enormous outdoor areas. The big thing to watch out for is the combat shotgun, tucked away in a not-so-secret cubby and only accessible during your initial climb down from the starting terrace. 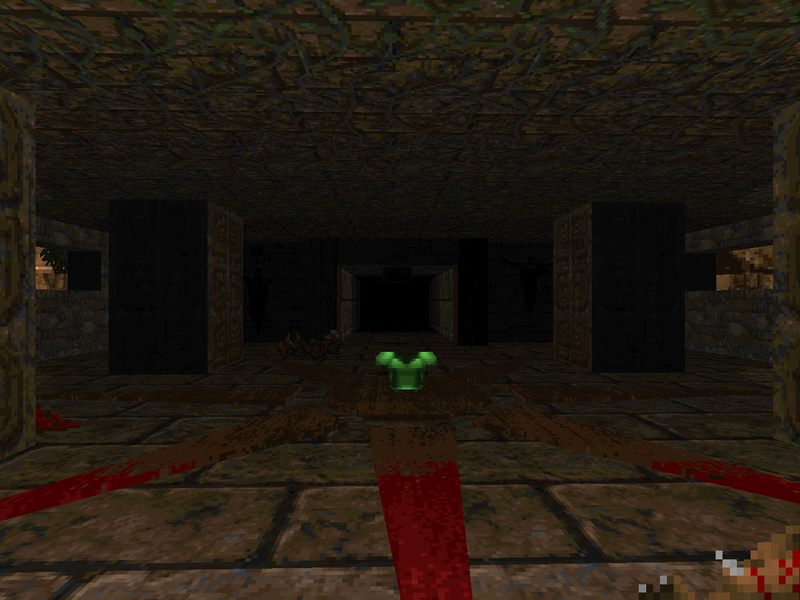 The combat otherwise continues the same trend established in the previous level. 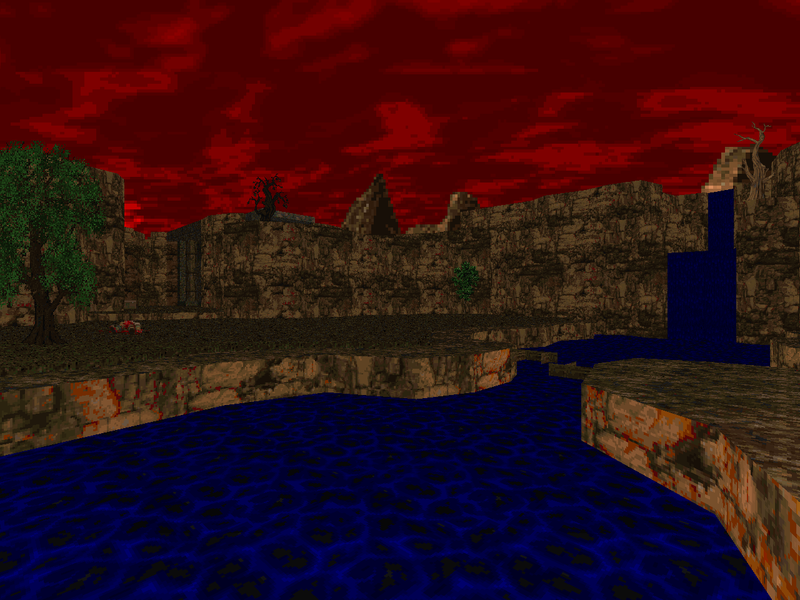 The outdoor areas favor player exposure (including a more climactic Cyberdemon showdown early on) and the interiors are loaded with some of the most dangerous traps seen so far. I was more surprised by the penultimate chamber's mancubus murderbrawl than the skeletal drip feed that actually closes out the action. Not the grand finish I was expecting but honest to the end. I remember really enjoying this one, and I still use it often for testing weapons mods. I dug the Aztec aesthetic, too. 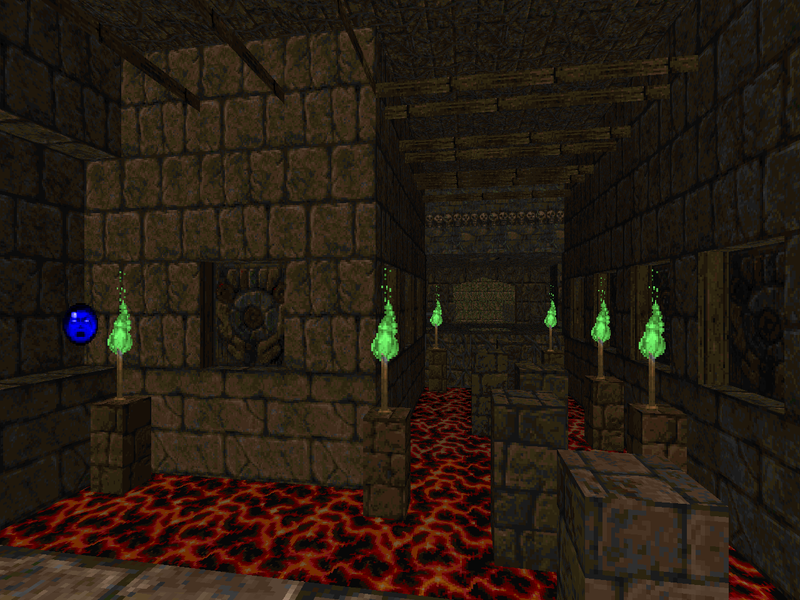 In retrospect, RUINBROS looks pretty good to test stuff with. Its pistol start combat is a little overtuned and favors close-quarters combat which is where you'd rely on the niches of each particular weapon the most. Not to mention if you make lots of mods with new guns that need testing, the iwads get boring real fast. 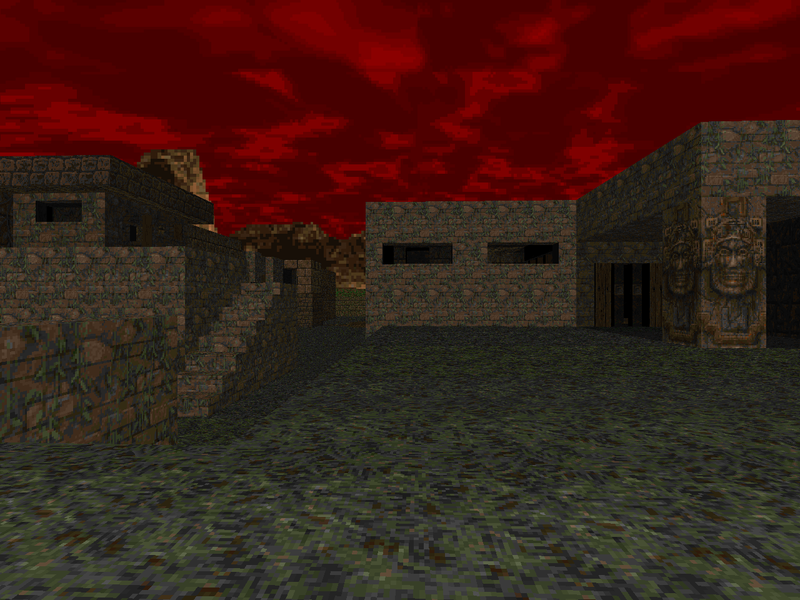 This was actually one of the first PWADs I had played, and yes, it was the unique (relatively speaking for Doom anyway) aesthetic that drew me to it. I think I found Mayan Mishap via this blog shortly after. 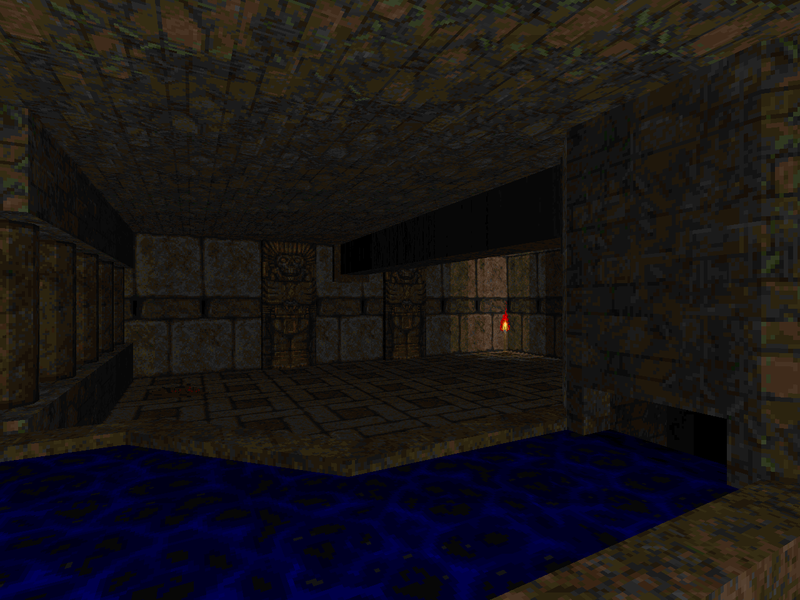 I always thought people could do more with Hexen II resources. I see them in Quake sometimes (e.g. Arcane Dimensions).